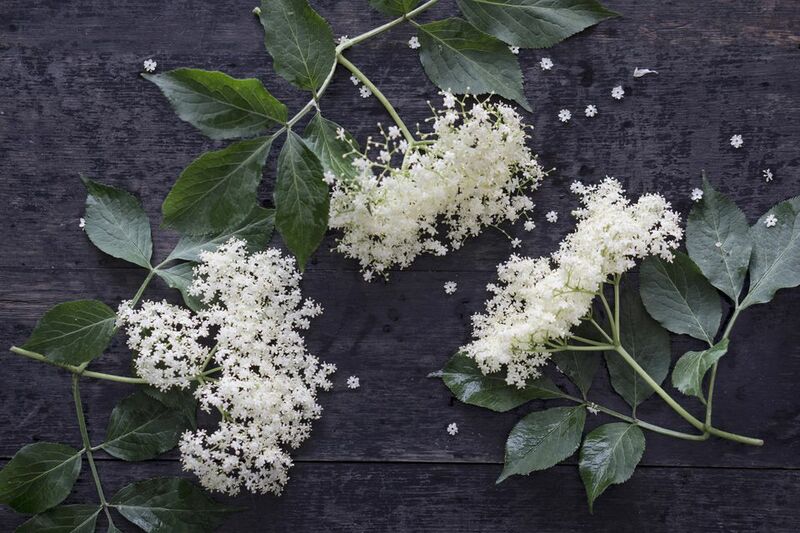 Elderberry, specifically the subspecies Sambucus nigra and Sambucus canadensis, has been used for centuries to fight colds, flu, and viral infections. In recent decades, new interest in the plant has led to several large studies to determine its efficacy. Impressively, it turns out that elderberry stimulates the body's immune system, is a potent antioxidant and really can shorten and decrease symptoms of colds and flu. You can make elderberry syrup, jelly and other goodies with the elderberry, but this tutorial focuses on making elderberry tincture, an alcohol-based extract of elderberry that has medicinal properties. Clean mason jars. Wide-mouth jars work best because it's easier to get the berries into them, but you can use whatever jar you have. They don't even have to be proper mason/canning jars; anything with a tight-fitting lid will work. Use glass, not metal. A source of elderberries. Fresh, local berries are best, but you can also order dried berries in bulk. If your berries are frozen, let them thaw and then continue with the instructions. A fork for removing the elderberries from the stems. A bowl and a colander to store and wash the elderberries. 100-proof vodka. 100-proof vodka is typically used in tincture-making because it is 50 percent water and 50 percent alcohol, comprising a standard solution. You can use regular vodka or even brandy in a pinch, though. If you have planted your own elderberry bush, that's great. Otherwise, identify the elderberry bush before picking anything, as it's easy to confuse elderberry with the toxic water hemlock, Cicuta mexicana. You can tell the difference because water hemlock's stems are hollow with purple stripes. All parts of water hemlock are toxic, so don't touch the plant. Remember that raw elderberry can cause nausea, so resist the urge to sample the berries. You'll want to pick only ripe elderberries. The berries are ripe when they are a deep purple-black color and slightly soft to the touch. Use scissors to snip off the purple berry clusters with stems intact. This makes it easier to strip the berries from the "umbrells," the umbrella-like, delicate stems that they grow on. Use the large central stem as a handle while cleaning off the berries. Use a fork to gently pull the berries off the umbrells. Start at the bottom of the cluster and work your way up toward the main stem. Remove any bits of stem that got into the bowl, and place them in a large colander. Rinse well with plenty of cold running water and drain. Optional: Take a potato masher or put the berries in your blender and mash them a bit. This applies only to fresh berries, not if you're using dried. Spoon or pour the washed elderberries into a clean, dry mason jar. Fill the jar loosely with the berries up to about one inch from the neck of the jar. Pour 100-proof vodka or spirit of choice over the berries, covering them completely. Fill the jar almost to the brim with alcohol. Allow the tincture to steep for two to six weeks. Shake the jar each day. For the first week or so, unscrew the lid each day and check to be sure the berries are covered with vodka. Top off with additional vodka as needed. After six weeks, strain the tincture through a colander into a bowl, pressing as much tincture out of the berries as you can. Rebottle the resulting liquid in a clean jar, label it and store it in a dark place. Discard the berries. Herbal tinctures will stay good for one to two years; they will slowly lose potency after this time. If you ever see mold or smell an "off" smell, don't use the tincture.